This information is intended for people who have either seen us flying at our sites, or watched online videos and are looking to learn to fly a paraglider or hang-glider as an absolute beginner, completely new to the sport. Most beginners we speak to usually ask our Club the same four questions, which we try to answer, and our Club Senior Coach gives you a pilots viewpoint of the trials and pitfalls of learning to fly. The simple answer is No. Unfortunately, we cannot teach you to fly here at the DHPC as we are a BHPA Recreational Club for pilots that have already completed their training and passed the BHPA ‘Club Pilot’ rating at a BHPA Registered School. Schools are where you learn to fly, and Clubs are where you fly after you leave the School, having bought your own wing and equipment. To fly with our Club, or indeed any UK Club, you must first pass the BHPA ‘Club Pilot’ rating at an approved BHPA Registered School. You can ONLY learn to fly as a beginner at a BHPA Registered School. You will be taught to fly by fully qualified professional BHPA Instructors, all trained, regulated and monitored by the British Hang-Gliding & Paragliding Association (BHPA). All BHPA Registered Schools wherever they may be located, in the UK or abroad, follow the exact same syllabus and structure dictated by the BHPA in order to train beginners up to the ‘Club Pilot’ rating. So whichever school you choose you have to pass the exact same practical flying tasks and exams before you can qualify with your ‘Club Pilot’ rating and fly on your own at any Club site. Unfortunately, there are no BHPA Schools that teach paragliding or hang-gliding in the Luton & Dunstable area, you will have to travel to the where the large hills and BHPA Schools are based, mainly Derbyshire, the Yorkshire Dales, the M4 corridor around Swindon, the South Coast and finally Wales. One of the closest schools to Dunstable is ‘Green Dragons‘ in Woldingham, Surrey, just off the M25 (Junction 6) and they teach both paragliding & hang-gliding. Many of the pilots in our Club have trained with Green Dragons. Very popular paragliding schools along the South Coast are; FlySussex and Airworks Paragliding Centre. For learning Hang-gliding schools you may have to travel a bit further, there is Airways Airports and Peak Airports both in Derbyshire and Lejair Hang Gliding (which is Tow training) based in Norfolk. On the South Coast; Southdown School of HG and Airports Sussex for tandem hang-gliding flights. Foreign BHPA Registered Schools in Spain and France are also popular, as flight training can be combined with family holidays, but be aware that the weather can also limit your training abroad, as is the case in the UK, and you may not complete the course and have to finish your training when back here in the UK at another school. If you do decide to start your training abroad you MUST use a BHPA Registered School, if you don’t your rating is not valid in the UK and you will not be allowed to fly at any UK Club’s sites. ‘FlySpain‘ the largest BHPA registered paragliding school in Europe, has a excellent reputation and lots of pilots in our club have learned to fly with them. The British Hang-Gliding and Paragliding Association (BHPA) is the governing body for Hang-Gliding and Paragliding in the UK. The BHPA supports a country-wide network of Recreational Clubs and Registered Schools, and provides the infrastructure within which hang-gliding and paragliding in the United Kingdom thrive by training pilots through the BHPA Pilot Rating Scheme. By Law, for hang-gliding and paragliding, you need to be over 14 years old to fly solo. Most BHPA schools will often set their own higher age limit, usually 16 years old. Under 18’s need written, signed parental consent to learn to fly. There is no real upper age limit provided you are reasonably fit, as you will be climbing large hills throughout your training, but if you suffer from any medical condition such as epilepsy, fainting, giddiness, high blood pressure, heart condition or diabetes you should ask your Doctor’s advice before booking a course. Throughout your flying career you must maintain your membership of the BHPA. All Clubs require BHPA membership when flying their sites, due to £5 million third-party insurance liability arranged through the BHPA. The BHPA also publishes Skywings, the only magazine dedicated to free flying in the United Kingdom. This glossy full colour magazine is distributed by mail to around 6,500 BHPA members each month as part of their membership package. The BHPA Pilot Rating Scheme has been devised to encourage pilots to progress their personal ﬂying skills and to provide a quick and simple means of indicating their proﬁciency level to others. Awards and ratings are achieved by completing flight tasks and exams during your School training course and through your Club. The BHPA Pilot Rating Scheme uses the 'Red Ribbon' system to identify newly qualified Club Pilots (CP+) fresh out of the School. These are literally long red ribbons, which are visible in flight, which inform other club members and Club Coaches that these new inexperienced pilots have under 10 hours airtime and may need extra help and advice when flying on their own at Club sites. This red ribbon will be either attached to the pilots harness or the glider itself. Awarded by Registered School BHPA Instructors during your training to mark the successful completion of the introductory stage, and to indicate your suitability to undertake further training. This is also completed within your chosen School by BHPA Instructors. Completing the Club Pilot Rating marks the end of your formal instruction and qualiﬁes you to leave the school and ﬂy with any BHPA Club. After you have obtained your Club Pilot (CP) rating, you can now leave the School and fly on your own with any Club (such as the DHPC). Clubs do NOT hire out gliders and equipment, you must buy your own. The flying tasks and exams for this next rating are completed within our Club and then signed-off by our own BHPA Club Coaches. This rating is the minimum for pilots to undertake Cross Country flights. Also completed within our Club by BHPA Club Coaches. This is the final and highest rating within the BHPA Pilot Rating system and qualified pilots can now enter FAI competitions and the British Team. The BHPA have a Elementary Pilot Guide (PDF), which is full of useful information about learning to fly (click the button below to download), or visit the main BHPA website which is packed with information about starting to learn to fly at your nearest school. A difficult question to answer. How long did it take you to pass your driving test? Some drivers only take ten lessons and pass first time, others have to do thirty lessons and they pass their test on the fifth attempt. Flying training is very similar, some people just naturally grasp the necessary skills and learn quicker than others. You will find that students that have prior aviation knowledge, flying any other type of glider, building model aircraft, and now even power-kiting – grasp the basic theory better than most. People who are naturally well co-ordinated and have good balance will also tend to do much better than average. Balance, technique and co-ordination are very important in the learning process and uncoordinated clumsy people tend to struggle to learn to fly as a rule! As in my earlier analogy of taking driving lessons, the students who take longer to learn usually pay far more for training, as a result of paying lesson by lesson, week after week. This may start to get expensive if you are a slow learner. So to alleviate this problem most schools offer a “fixed price deal to Club Pilot” which enables you to keep training for as many lessons as it takes in order for you to pass the ‘Club Pilot’ rating. So… you can keep training towards the Club Pilot rating, week after week for as long as it takes, all for one fixed price. If you intend staying with the sport this is by far the best and cheapest way to train. If you also buy a brand new glider through the school to complete your training on, you will save even more as you have your very own wing to learn on instead of waiting while other course students tie-up all the school gliders. Plus, you now also have your own equipment ready for Club flying when you leave the school. The “Catch 22” clause is that you usually have to pay up front, before your training starts, so if you drop out the course after a month or so, you will lose out. So, its a delicate balance, slow learners pay far more than quick learners if you pay lesson-by-lesson on the course, but paying the course in full at the start gives huge benefits. More up-to-date information can usually be found on your chosen School’s website. Discuss the finer details with your chosen School when you first book your course. So… you have arrived at the School - what happens now? Well, kit yourself up for the day with a packed lunch, plenty of water to drink and a pair of walking boots for good ankle support (make sure the laces don't use hooks at the top) and a weather-proof jacket to keep out the cold, wind and the odd shower. That's about all you will need. However, most training hills are a long way away from shops and toilets! Your Training School will have their own student gliders and you will use these until you qualify at the end of the course, unless you chose to buy your own glider to train with. The Airworks Paragliding Centre on the South Coast have a online video (below) that will give you a taste of what flying training is like. Your first morning will probably start with the necessary paperwork being organised - insurance and temporary BHPA membership etc. Followed by an introductory presentation about flying, explaining the technical terms and details of your intended training (Hang/Para) glider, and flying theory in general. Then, it's out onto the hill training slopes to actually see, and set-up (rigging) a glider and complete the relevant safety checks. Your Instructors will then demonstrate with the glider the initial ground-handling skills you need to learn. Now it's your turn - and now the hard work starts - trying to control the glider on the ground and pull it up over your head under control, all with the wind blowing you all over the place… it's not as easy as your Instructors made it look! This takes at least a day or so to get sorted, depending on your skill. As for the actual day-to-day training, most students should have their feet off the ground (and I mean 4 feet off the ground) on the first or second training day, although these will be a short flights from a gentle slope. As your training continues you’ll get more proficient at launching and landing and your School Instructors will start to let you launch from higher and higher up the training hill. Eventually, you should be completing your first high (200ft+) top-to-bottom flights of the training hill, hopefully within your first week. You should now have completed your ‘BHPA Elementary Pilot’ Award and be ready to start to move on to your next rating, the ‘Club Pilot (CP)’. It now tends to get progressively harder to master the more advanced training, as your own skill and ability, weather and wind speed start to dictate when you fly. On average most students take ten to fourteen flyable* days to reach the Club Pilot skill level of completing your flying tasks and being able to fly high above the hill and land at the bottom or even back on top of the hill! From now on the TV weather forecast starts to dominate your life, and you become a weather geek! You will constantly be watching weather forecasts for good weather training days. Unfortunately – the actual weather never seems to cooperate, you might drive all the way to the School only to find that the wind speed there is stronger than the forecast and you can't fly, or you have to go to a family wedding on the best training day of the year! Sometimes six weeks can pass between one suitable training day and the next because of poor weather, and the problem with this is, you may have almost forgotten what you learned on your last training day! This can be mostly blamed on the changeable British weather – If it’s wet or too windy you can’t fly. If there’s no wind you can’t do your soaring flights high above the hill. If it’s a hot sunny summers day the air will to too rough for you to fly with your experience, you will have to wait until evening for the thermals to calm down. To get ten flyable training days may take six to nine months or more of actual time because of unsuitable training weather, so be aware of this when you book your school location. This time delay also helps to wheedle out the students who are really not that bothered in learning to fly – sorting the “wheat from the chaff”, as they say. …you will never forget that day for the rest of your life! I have also met many pilots over the years who have had perfect weather on their training course and some have finished the Club Pilot rating in ten actual days - but that’s all down to luck…the jammy b******s !!! In my personal view, course students generally tend to fall into one of the following four learning categories: Natural Ability, Careful, Nervous and Utterly Hopeless. The first two being the students who learn quickest. There is nothing wrong about being a Nervous pilot, some people just need more time to learn the required skills. It takes them just a bit longer to learn at their own pace. Some really good pilots I know came to me for coaching as ‘Nervous’ pilots when they first joined the Club. Unfortunately, it’s the ‘Utterly Hopeless’ group who are usually most at risk, as they are talked into coming along to a training course by a partner/best friend who doesn’t want to go on the course on their own. These ‘Utterly Hopeless’ students actually have no interest in learning to fly, it’s not in their blood, and are either too embarrassed to admit to their friends that they don’t want to learn, or they go along with it just for a laugh. These are the students who need watching, as they statistically tend to have the most accidents! Hopefully, they soon give up learning to fly half way through the training course. A personal insight from the Club’s Senior Coach. “Speaking personally as a pilot that flies both hang-gliders and paragliders, my personal view is that paragliding is far easier to learn in terms of actually getting airtime and getting the thrill of flying when you start to learn at the school. This is shown by its continued popularity and the sheer number of Paragliding Schools. Learning on a paraglider you will be airborne quicker and be getting the real thrill of flying much sooner than when you learn on a hang-glider. Hang-gliders are much heavier than a paraglider, and also fly very much faster as well, therefore, early landing training takes that much longer to learn, as you are flying at speed and must learn to precisely stall the hang-glider wing to land on your feet safely! The Hang-glider – has an internal rigid framework made of aluminium or carbon fibre tube which the sail fabric is permanently attached to. Pre-shaped aluminium battens inserted inside the wing give it its aerofoil shape and a rigid triangular control frame is used by the pilot to control the gliders speed and direction by weight-shifting left or right to turn, and moving the control bar forwards or back to increase or decrease speed. Flying a hang-glider needs much more pilot dedication and flying skill, which includes ground-handling practice and landing training, because of its weight (25kg+), fast flying and landing speed, and physical size (30ft wingspan). The Paraglider – is much lighter in weight (6kg) because it doesn’t have a rigid metal internal framework, the wing is just two layers of high-tech rip-stop nylon fabric sewn together with internal nylon fabric ribs. Rectangular slots in the wings leading edge are used to pressurise the wing as the wind passes through, trapping air inside and maintaining the wings aerofoil shape in flight. The pilot sits in the harness which is attached to the wing above by the control lines. The pilot controls direction by weight-shifting and pulling down the brake handles, one in each hand, which deform the wing’s trailing edge on either side, which initiates the turn in that direction. Hang-gliders can fly in much stronger wind strengths as they can fly at much higher speed than a paraglider – and you will still be in the air whilst all the paragliders are sitting on the ground jealously watching you. Hang-gliders are far more suited to aerobatics, fly much faster than a paraglider and do not suffer from mid-air collapses, that can happen to a paraglider in turbulent air. Hang-gliders when packed in their travel bag are much heavier than a paraglider, weighing on average about 30kg, which you carry on one shoulder up the hill to the launch point. So if you fly in the Lake District a lot, or indeed anywhere with large hills like Wales, then you have a mountain to climb with it on your shoulder – literally! Hang-gliders need to be transported on a car’s roof rack with a front bonnet support or ladder to support the length of the packed glider (approx 19ft in length). Hang-gliders can take 20-30 minutes to set up and another 10-15 minutes pre-flight checking (this is due to the assembly of the glider and internal framework held together by nuts, bolts and wires which needs thorough pre-flight safety checking for any damage). Hang-gliders however, are much harder to land as their stalling speed to land is fairly high (10-12+mph) and need a planned landing approach as well as a well-timed flair to stop the wing, especially in nil-wind. Hang-gliders have a much better glide angle through the air and consequently they need a larger flat landing area to land in. Landing a hang-glider safely is by far the hardest skill to master! Hang-gliding takes a lot longer to learn in order to be a competent pilot…BUT… you really feel that you are flying on a hang-glider, as you swoop and turn at speeds of up to 70mph in a dive, twisting and circling in the air, they are a joy to fly, whereas on a paraglider you just feel you are dangling under the canopy, barely moving forward and just hanging there at the mercy of the wind! A paraglider is much more portable than a hang-glider, a paraglider can be easily transported in the boot of a car as they are about the size of a large rucksack. You can even strap one to the back of a motorcycle. Paraglider’s are also easier to ground handle at launch once you have acquired the necessary skills – but it is far easier to be dragged along by a strong wind if you get the launch wrong. Paragliders can be set up faster for flight, you literally get to the launch point unpack it, shake the lines out, pre-flight check the wing, put on the harness and take-off, all in under 10 minutes. Paraglider’s are ideally suited for late evening flights after work. Paragliders, because of their slow flying speed are more manoeuvrable, can turn tighter and are able to land in much smaller landing areas than a hang-glider. They can also slope land on the side of the hill enabling lots of shorter flights if conditions are marginal. 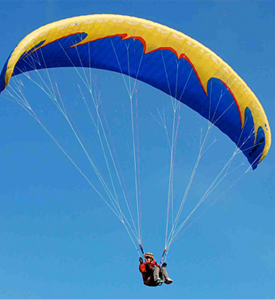 A paraglider being only made of nylon fabric and having no rigid framework, is prone to midair collapses in turbulent air, and these must be recovered by the pilot in the correct manner if an accident is to be avoided. There comes a point on a paraglider when the wind speed when you are in the air, becomes greater than the paragliders top speed (about 15-18mph on an beginners glider) – and should you still be flying at that point, you will then start to be blown backwards with the wind – this is the time to land quickly! The ease of learning paragliding is why you see far more of them at club sites than hang-gliders nowadays. As for storage, you will need a large garage to store a 19ft hang-glider, but a paraglider can be kept in a cupboard! This is another main reason why people choose paragliding, especially if you live in a small flat in a city. Where would you store a 19ft hang-glider if you live in a flat? Typical course prices vary from school to school but on average you will pay roughly £1,200 - £1,500 for a combined EP/CP course which will take you through to the Club Pilot rating. Remember that this cost is the Training course fee only, you will then have to buy a paraglider for yourself once you qualify from the Training School. However, if you buy a brand new wing to learn on from your Training School, you can use this during your School training and you then have your own glider already when you start to fly with your chosen Club. (Prices as of May 2017). Check with your School's website for revised pricing. Once you have your BHPA Club Pilot rating and leave the School, you must now buy your own wing, harness and various accessories in order to fly with any Club. Club's do not hire any equipment. Other expenses are yearly Club Membership (DHPC is £20 per year) as well as BHPA membership (£99 per year) and this includes your 3rd Party Insurance Fee, as well as twelve issues of 'SkyWings', a monthly colour magazine. New paragliders are not cheap, although they do represent one of the least expensive ways to get into the air. A new competition paraglider is likely to cost over £4,000, but a paraglider suitable for a recently trained pilot is more likely to cost around £2,500 – £3,500 brand new, and secondhand canopies can be obtained through our Club for as little as £500 and above. You will also need a harness, helmet, flying suit and boots. Later, as you become more experienced, you may also want to purchase additional items, such as an emergency parachute or a GPS or Vario/Altimeter flight computer. A new top-of-the range carbon-fibre competition rigid-wing hang-glider can cost well over £15,000+ brand new, but you won’t be buying this type of advanced glider for a few years. (You wouldn’t buy a Formula 1 car the day you passed your driving test!) Beginner and Intermediate Sports gliders with less performance, suitable for low airtime beginner pilots are available from around £800 second hand to over £8,000 brand new, depending on how many carbon-fibre extras you get. You will also need a harness, helmet, flying suit, and boots, and later you may also want to purchase additional accessories like reserve parachutes, cameras and in-flight GPS & Vario flight instruments. 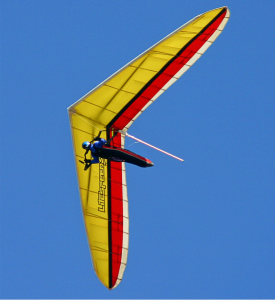 Always buy new or secondhand gliders through either your training School or through your chosen Club. Speak to your School Instructors if buying a brand new wing, they know you better than anyone what type of pilot you are (nervous, careful or natural ability), and will advise suitable wings accordingly. Do not be tempted into buying a wing which is too advanced for your low-airtime, you may not live long enough to enjoy it! Seriously… your first wing dictates how well you will progress in the sport and how much enjoyment you will get from it in your early flying career. Buying through your Club is great for buying a secondhand wing, Club Coaches will know the glider’s owner and full history of the glider. Has it been continually dragged through the mud and neglected? Has it been ripped on barbed-wire fences and is now covered in patches? Or, was the previous owner a careful skilful pilot who really looked after their equipment and kept the wing looking pristine? Club Coaches will know this information and will also test fly the glider for you to make sure it is airworthy and suitable for your skill, before you part with your cash. These gliders turn up all the time on auction sites for a reason, the seller is trying to find a gullible beginner who doesn’t know what they are looking at. The wing may be an old un-certified model and the seller is trying to sell it for far more than its actually worth to recoup their losses by saying its almost brand new. (Non-certified gliders are invalid and are worth absolutely nothing !!!). Schools or knowledgeable pilots won’t touch them…that’s why they are sold on these sites!! Do you really want to get seriously hurt or worse just for saving a few quid? Yes, it is… to the reckless, over-confident or undertrained pilots - but as long as you follow the training syllabus and learn with professional schools and proceed steadily, you are probably in more danger driving your car to work every day. In general, the accident rate is higher for paragliding compared to hang-gliding, mainly attributed to the sheer number pilots that paraglide these days. The most common injuries in both sports are twisted or broken ankles and legs, as these are used as your undercarriage for landing. Back injuries are also common in paragliding, which is why most modern harnesses have a rear airbag protector built-in to them. Good quality flying boots are also essential to protect the ankles in heavy landings. Hang-gliding major injuries tend to be of a more serious nature as the higher flying speeds increase impact forces in a crash landing, especially as the pilot flys head downwards. Minor hang-glider landing mishaps tend to do more damage to the glider’s aluminium or carbon fibre control frame 'uprights' which tend to get bent on heavy landings, and are expensive to replace. The pilot usually walks away unscathed from these ‘bent upright’ landings. Paragliding minor mishaps are far more likely to be holes or rips to the nylon wing fabric, usually from tree or bush landings or barbed-wire fences. These tears or large rips require a specialist fabric patch repair done through the gliders dealer or maybe the manufacturer if it's really bad. WARNING - Please be aware that ALL flight based sport is inherently dangerous, especially for the low airtime, untrained or over-confident pilots. Every year there are fatalities in this sport and this is a risk assessment that you must consider before starting to learn. The only truly safe way to fly is not to do it in the first place! Paraglider and Hang-glider wings are designed and certified specifically for the safety and experience ability of their intended pilot. There are three categories of wings: Beginner wings, Sport (Intermediate) wings and Advanced (Competition) wings. Always make sure that as a beginner, you fly a wing appropriate to your flying ability and airtime. Flying an Advanced Competition glider as a beginner will probably kill you, if perhaps you were stupid enough to buy one online and attempt to fly it, as these gliders are extremely unstable and require a massive amount of pilot experience and ability to fly safely. Beginners wings are designed with lots of safety and stability built into the design to help the inexperienced new pilot who are usually a bit ham-fisted on the controls. However, these gliders are poor on performance and flying speed. High performance wings however, are very fast with extreme performance capabilities and are very difficult to fly. These advanced wings take a lot of pilot skill and experience and may have radical wing collapse traits in rough air. Paraglider/Hang-glider design means that there is always a trade-off between safety and performance, you cannot have a safe high-performance Advanced wing. It is the beginner pilot's who move up to higher performance wing far too soon (trying to copy club sky-god experienced pilots), and subsequently fail to have the necessary skills to fly them safely, that cause the most accidents. This is probably the number one reason for fatalities in our sport. Always get professional instruction with a BHPA School Instructor when learning. Don’t buy a glider on eBay and try and teach yourself to fly… you may laugh but people try it. Some of them survive and take up a wheelchair sport afterwards! This is not a sport for the ‘lets have a go for a laugh‘ blokes in the pub type. Flying takes time and dedication to learn safely, it can take well over a year or more to learn to become a competent club pilot. says the quotation and it’s never been wrong! As you start to learn you will soon find out how fickle the air actually is. Just like water, the air can be mill-pond calm one minute and white-water rough the next! This can catch out low-airtime pilots and put them in serious uncomfortable situations. Knowing when to fly is vitally important in learning, and recognising the signs of rough air is a skill that needs acquiring. In summer, beginners should fly early morning or late afternoon/evening when the air is calmer. Beginners should never fly in the heat of the day – that’s when the air can get really rough with strong turbulent thermals which throw the wing around and will cause wing collapses. (S.C) Please note: A Paraglider has absolutely nothing in common with the parascending chutes that are towed behind speed boats in your holiday resorts. Those are just parachutes dragging you in the air using the engine power of the tow-boat, where you just hang on and go for the ride, you have no control over the chute.A paraglider has to be flown using its controls at the correct speed by the pilot, and will stall in the air and descend very rapidly if the pilot is too heavy-handed on those controls. If this serious stall causes the pilot to hit the ground… this usually is fatal. Safety wise it only takes one bad error of judgement or over-controlling the wing in the air by the pilot – which quickly escalates into a dangerous incident…and as YOU, (the pilot) are up in the air alone… no one else can help you sort out the situation but you. You are the only person able to prevent a more serious accident happening when something else goes wrong, and it will at some point believe me! This is when experience, coaching and your training kick-in, to sort out these problems safely when everything goes horribly wrong in the air. Every pilot starts with a bag full of luck and an empty bag of experience. The trick is to fill the bag of experience before you empty the bag of luck! A thinking pilot is a safe pilot, learn from the mistakes of others and analyse and plan your flight before you arrive at the launch point on the hill. My grandad always said, "If you want to learn to do something the easy way - watch some idiot doing it the hard way!" Listen to Club Coaches, get valued advice and progress your flying career carefully. Some beginners as well as more experienced over-confident pilots have scared themselves so badly when flying that they immediately give up the sport and sell all their equipment, others unfortunately never get that second chance. but…it’s so much FUN !!! So… if it’s so dangerous, why do I fly? Like a lot of other pilots, it is the danger… it is the adrenaline rush… and the absolute fantastic thrill – that makes it all worthwhile and part of the reason we as pilots all fly in the first place. If you as an individual become overly worried about danger, then this is not the sport for you. You can tell him you were 3,000ft above Bedfordshire on a hang-glider or paraglider!